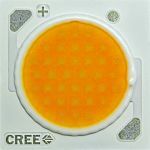 COB (Chip on Board) LEDs are compact LED modules with a bright light output. They consist of a small square or circular substrate which houses multiple LED chips/dies. These are covered with a phosphor coating. The most common colour of COB LED is white, however there a few more colours available as the technology develops. 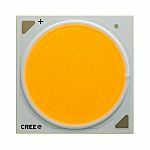 COB LEDs have a base substrate, made of aluminium or ceramic, on which the LED dies are mounted. The actual LEDs provide a blue light. The number of LED dies and their typical luminous flux determines the brightness of the COB LED. The layer of phosphor, which is an orangey-yellow colour, sits on top of the LED dies. The phosphor converts the blue LED dies into a white light. The type of phosphor creates different colour temperatures. Colour temperature describes the warmth or coolness of the LED light output. 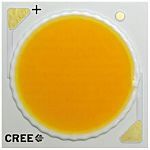 Warm COB LEDs offer a yellow-orange light output while Cool COB LEDs tend to be a bluer white. Colour temperature is measured in Kelvins with the symbol K. 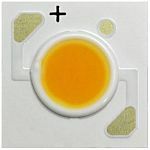 What are the advantages of COB LEDs?